If you have spent any time scrolling through one of the most popular apps of the moment, Instagram, it is likely you have seen a paid advertisement. It's no secret that the PR representatives for companies will often send free products to well-known figures. It gives them the chance to try out the product and hopefully share a positive review with their followers. But as it turns out, you don't always have to have thousands of followers to get this perk. Welcome to the new age of "micro-influencers". These lesser-known influencers are simply your everyday content creators who were sent a product and want to share their opinions with their followers. The problem with that? Many are not sharing that their post is actually an advertisement. Although they don't have the same dedicated following as celebrities, they still have to follow the same standard rules and principles to keep the content on social media ethical. With the new age of advertising switching from print to social media, there was a gray area where the rules and regulations for advertising needed to be updated. The Federal Trade Commission took the time to update their rules and give clear answers to people searching for how they should handle marketing on social media. The FTC's Endorsement Guide is the official location anyone with a question about paid advertisements should go to. They say words such as sponsored, promotion, paid ad or at the very least #ad need to be clearly stated in every case. "If there's a connection between an endorser and the marketer that consumers would not expect and it would affect how consumers evaluate the endorsement, that connection should be disclosed." It is possible to think that micro-influencers are simply unaware of these rules in marketing, for they are not routinely exposed them. However, the smaller influencers are not the only ones "forgetting" to show their connections. 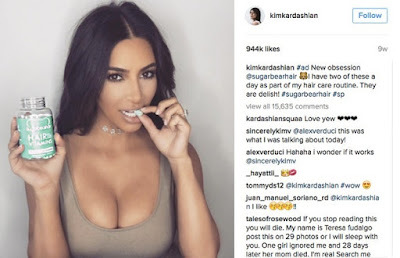 An article on Engadget stated, "As it stands, celebrities like Kim Kardashian are openly ignoring the law, taking to platforms like Instagram and Twitter to advertise products or services without letting followers know they were compensated for doing so." According to the same Engadget article, the FTC is not just cracking down on the influencers themselves, but on the companies sending the products. The companies are responsible for informing their endorsers how to properly label their posts. This phenomenon no only limited to Instagram. It can be found on all social media sites, including YouTube. Many YouTubers have been getting backlash for making sponsored videos, aka videos with paid advertisements. If you spend the time to scroll through the comments under a video, there is a astounding amount of people who are angry that the YouTuber has sponsored content. So whether you are on Instagram or YouTube, there is a chance you will find a heated debate concerning advertisements or sponsorships. With the FTC working hard, hopefully the debate will end soon with people acknowledging that they were paid to promote.